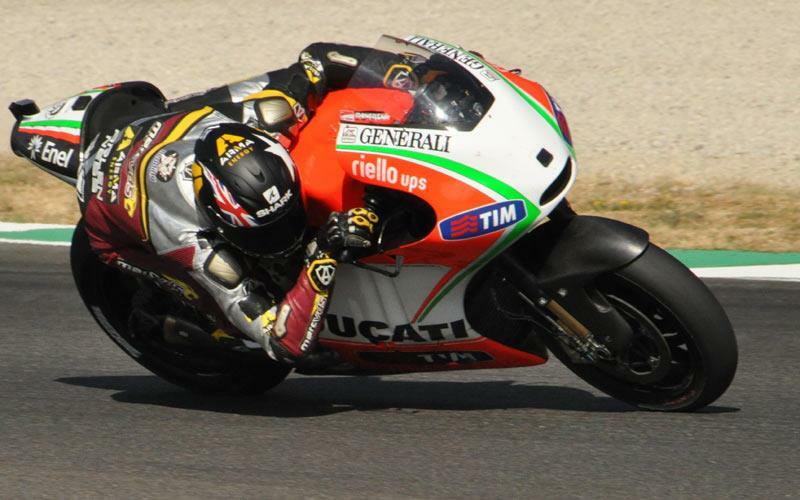 Scott Redding will agree a MotoGP deal for 2014 after this weekend’s German Grand Prix at the Sachsenring. Where and what he will be riding is a decision the 20-year-old will agonise over after the Sachsenring clash, with the Moto2 world championship leader certainly not short of offers. Red-hot rumour after he narrowly failed to claim a third victory of 2013 at Assen last month is that Redding will take a huge gamble on a Ducati offer. An attractive alternative also grabbing his attention is the chance to ride a new production Honda RC213V in Fausto Gresini’s squad. There is still the potential for his Belgium-based Marc VDS Racing squad to move up to MotoGP with the Gloucestershire starlet, who holds a 30-point lead over Spanish title rival Pol Espargaro in the Moto2 title hunt. The Marc VDS squad has been negotiating with Ducati about running a factory spec Desmosedici, while also pondering the chance to lease a Yamaha YZR-M1 engine in a Kalex frame or buying a production Honda RC213V to run itself. Redding, who got the dream chance to ride a 1994 Kevin Schwantz factory Suzuki RGV 5000 at Spa last weekend, told MCN: ‘I will wait until after Germany to decide because I don’t want to get my brain into thinking about MotoGP too much when I am fighting for the Moto2 title. At the moment it is all talk and if the Honda thing works good then I think that might be the better option but the Yamaha with your own chassis is a bit of a grey area. I don’t want to be doing this and I want to go into MotoGP and be competitive like Marc (Marquez). It is going to be a hard decision because I need to make the right steps now, “said Redding, who has now scored five podiums in seven races. Redding’s manager Michael Bartholemy hinted that Redding’s Ducati option could actually be for a factory slot next to Andrea Dovizioso, but the Bologna factory’s current dire form might sway them away from trying to recover with a young rookie. Bartholemy confirmed that Redding has two solid offers for 2014 with interest in capturing his signature likely to pull two more proposals before it is time to make a crunch decision. “It is crucial that we make the right choice. The options we have are very attractive but you have to think about beyond 2014. I will sit down and have a good chat with Scott about things before taking the final decision in the week after Germany. The good thing is Scott has plenty of interest and he is really motivated and ready to move to MotoGP, “said Bartholemy. Redding certainly appears the number one target for the Italian-based Gresini squad to ride its new production Honda RC213V machine in 2014. Fausto Gresini plans to run one of the new production bikes alongside a factory prototype RC213V, meaning the former 125GP world champion is ditching his CBR1000RR-powered CRT bike that runs a British-built FTR frame at the end of the season. Gresini told MCN that he is currently only negotiating with Redding and he said: “I have spoken to Scott and it is clear he is a strong rider. We started talking in Barcelona and I am only speaking with Redding, “said Gresini, who believes the new Honda production bike that will cost around £850,000 will be perfect for a MotoGP rookie.